I've always wanted full bookshelves. I love the look and feel of a personal library; a shelf filled with books that hold special places in your heart. Books that have been read, read again, and recommended to and by dear friends and family. I should also probably mention how much I love reading good books (almost as much as I love filling my bookshelves). I love finding a new book that pulls at my heart, gives me a reality check, and makes me fall in love with well-developed characters and storylines. So I'm looking for a some good reads. Books that are good for my future kids (yes, I am one of those people), books that are faith-filled, books that are design or photography-related, and books that encourage the young teacher in me. So what books am I hoping to buy? Well, I've made a little list of books and am hoping you can give me your input. Some of these books have been recommended by friends, by family, by teachers, and by bloggers and some are books I've read but don't own yet. My goal is to buy a book a month. I want books that hold meaning, that are worth my money, and that I can honestly recommend to others, too. 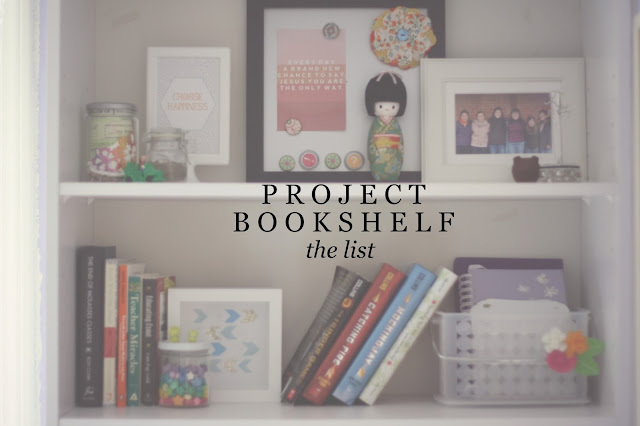 Project Bookshelf will be a new series where I'll post books I want to read, books I've read, books you recommend, and then the state of my bookshelves, too. My hope is that come December, I've got at least one shelf filled to the brim with books. Okay, now it's your turn--I need your help! Got any recommendations for this empty-bookshelf girl? Or have you read any of the ones on my list? p.s. 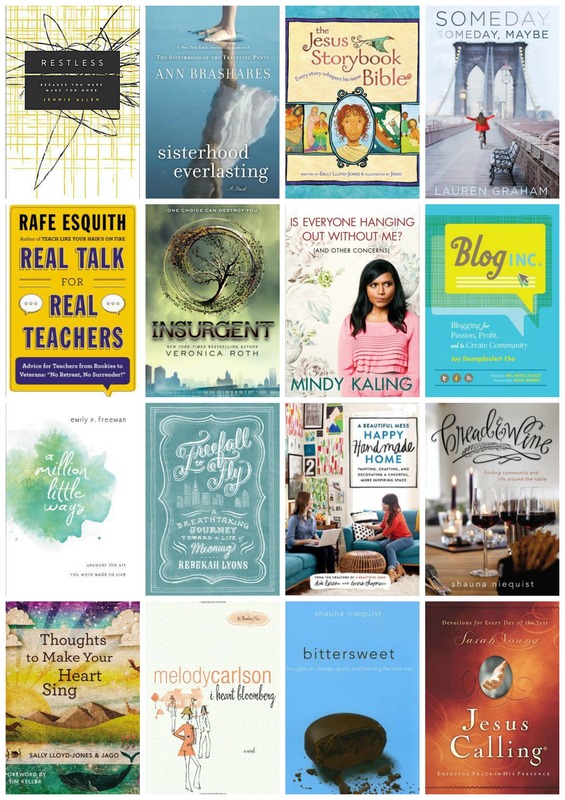 Many thanks to Megan, Christina, Jennifer, and Angela for recommending some of these books to me! i thought insurgent was very good. the end was like WHOA. i have also read mindy kaling's book. a funny, quick read. i highly recommend 'redeeming love' by francine rivers. it's loosely based on the book of hosea. it's beautiful. i love when people post book recommendations! it's the bookworm in me that browses each selection, reading the reviews and adding them to my never-ending to-read list. i can't wait to check out the ones above! ps: the bookshelf in the picture is styled SO cute! i love a pretty bookshelf. And that's my bookshelf right now! It's in desperate need of more books but I've had so much fun styling it in the meantime. I love this. I try to do the same for my daughter- A book a month to fill her bookshelf. <3 I'm working on mine as well, I just don't have specific goals. I haven't heard of most of these books, so I'm really excited to add these to my personal list! great post! Looks like lots of good suggestions here! I LOVE books....and I especially love REAL books that I can underline and write notes in, and have on real live bookshelves! I will have to bookmark this page for further inspiration! Thanks for the post Kiki! I love, love this idea! Recommendations; basically everything written by Jane Austen. Persuasion and Pride and Prejudice are my favorite. So Long Insecurity by Beth Moore. I'm not a huge reader, but those are my favorites. And I can't believe I forgot Beth Moore books! I've actually never read any of her books or Jane Austen's, so I've got to look into both. Thanks for the recommendations! There are so many good ones on your list! // The Jesus Storybook Bible is one of the best that I have seen. I've used it a lot with the kids at church (and work) and they have loved it. It has great pictures and the stories are captivating, as they should be when we are reading the Word! :) Definitely get that one! // I've had book one of the Divergent trilogy for awhile now and STILL haven't started it. Fail. // Mindy Kaling's book is hilarious. I'm about to finish it. // I love books on travel and any coffee table books! I'm also a big fan of Biographies. There are so many books on my reading list and now that I have a Kindle, I just keep adding to my wish list all. the. time. Looking forward to this series! Can't wait to see what comes along, add to my list, and maybe help add to yours! I'm sure I could mention a ton right now, but my brain won't let me! ha! Secondly, I've been thinking more and more about getting The Jesus Storybook lately! The kids I babysit have it and I've read it to them and I also teach Sunday School so it would be great to have another resource. That, and we both know I'm going to have kids someday and will need a great book to read them, too! Angela recommended I read Lauren Graham's book and since I've been watching Gilmore Girls like crazy and we both know I love Parenthood, so let's just say I have to read it someday. And I started Mindy's book but never got to finish it since I borrowed it from my library. I've been falling more and more in love with her as a person and actress and she's such an inspiration to me, too. Plus, she's hilarious. So that book is going to be finished someday, too. And Little House on the Prairie was a childhood favorite of mine! I loooved Laura and had these paperdolls of their family and played with them like crazy. Thanks for those recommendations! p.s. What kinds of biographies do you read? I've read a few in the past few years and would love to know if you have any recommendations! The good and beautiful god by James Brian smith. Under the overpass by mike yankoski. And I cannot wait to check out those other books you've recommended--thanks for sharing them!! 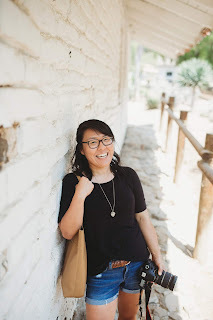 One of faves that I've recommended to a lot of friends is "The Defining Decade: Why Your Twenties Matter--And How to Make the Most of Them Now." It's a great book for grounding yourself in your 20s and understanding how the things you do now set you up for the rest of your life. And I've heard of that book, actually! I think that would make an amazing addition to my bookshelf--especially seeing as I'm a twenty-something. :) Thanks for the recommendation and happy reading to you, too!! I just started reading Bread and Wine, it's so fantastic. I reccomend Carry On, Warrior by Glennon Milton (if you haven't already read it). And the book Adulting is really funny and very helpful. Good luck with your one book a month. I've heard so many great things about Bread and Wine and as a Shauna Niequist fan, I know I'm going to add that to my bookshelf soon. I'm currently reading Cold Tangerines and also loved her other book, Bittersweet, too. Have you read any of Shauna's other books? And I've actually heard of Glennon's book before! I found her via Kelle Hampton (Enjoying the Small Things blog) and would love to read her book, too. I was always worried it was more of a "mom-book" but I think it would be a great read nonetheless. :) I can't believe I forgot about that one! And I'm going to have to look into the Adulting book. I think I've heard of it before and it really does sound good! Thank you for your suggestions, too, Alli! I was just thinking about putting together a list of children's books that I would like to have around so that I can keep my eyes out for them when I'm out and about. One series that I loved as a little girl (I didn't really grow up going to church) was the Alice in Bibleland series by Alice Joyce Davidson. I would look at those books for HOURS and gladly listen to anyone willing to read to me. Keep us posted on what you buy, what you add to the list, and what you think about different books! And I remember those Alice in Bibleland books! I never owned any but remember reading through them at church as a kid. You should definitely put together a list of children's books--I would LOVE to read your list. I've actually been collecting ideas for my future kids/classroom library and would love to read your list and add to mine! so good - such a good devotional! and this is a GREAT idea! "Starving Jesus" by Craig Gross & JR Mahon rocked my world and changed my life. also the devotional - "a call to die" is fantastic. i'll have to look through my books to find some other recommendations! I've heard amazing things about Jesus Calling and have wanted to read it for some time now. I think my mom actually has a copy of it but I haven't seen it on our family bookshelf for some time...I'm going to have to find it soon! p.s. Please keep those recommendations coming! I would love to know what you've got and what you recommend! I love these picks so much!! This is a great list. I'm a huge fan of Traveling Mercies: Some Thoughts On Faith by Anne Lamott. Such a good read - casual but so inspiring. love this! also, i am all about creating a library for myself. i love purchasing books for now, for later, for my (future) kids, etc. these are some great choices too! i'm going to have to check some of those out! i just finished the divergent series, i'm reading the harry potter books (i'm on book 5), and i'm reading Gift from the Sea. i have Bittersweet waiting for me next, too! Thanks for all of the recommendations, by the way! I've heard of Gift from the Sea and I can't wait to read more about it! I want to read Mindy's book, and have heard good things about it! Oooo please try The Outcast by Jolina Petersheim. It's fantastic. Oh and Dear Mr. Knightley by Katherine Reay. So mega charming.